In collaboration with KWS-Infra and tender office GAIM, Except organized an innovation session for a sustainable approach to the demolition of a part of the Catharijnesingel in the center of Utrecht. 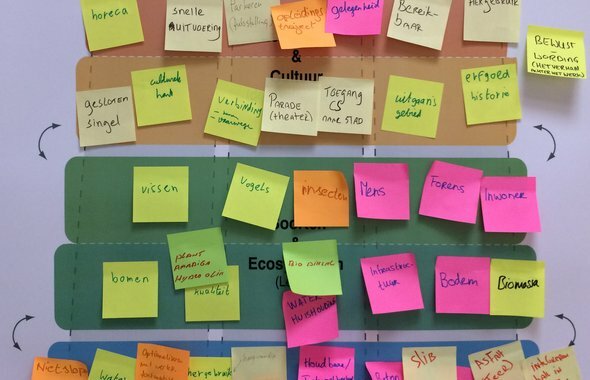 The approach reponds to the sustainability goals set by the municipality of Utrecht. Since its creation in 1999, Except Integratd Sustainability has been developing Symbiosis in Development (SiD), a strategic and integral approach to development, combining systems thinking, network theory, and lifecycle analysis. SiD efficiently changes ambitions into concrete and realizable measures. For KWS-Infra and GAIM, this approach resulted in 12 new insights, varying from creating a material-bank and an education trajectory, to positive impact by the integration of industrial heritage and reporting via the UN Sustainable Development Goals.